This beautiful machine is the ideal machine for a person who really wants to sew. 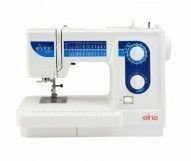 you don't need to be a designer general but having this lovely Elna Explore 340 will give you the incentive to pursue your imagination. EMBARK ON A VOYAGE TO NEW CREATIVE DESTINATIONS! with the Elna 340.